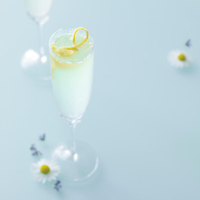 The fragrant floral notes and delicate spice of Bloom Gin are complemented by the bright citrus of lemon and Champagne in this French 75, which delivers a deliciously fresh-tasting effervescent cocktail. Chill a Champagne flute in the freezer for 5–10 minutes before serving. Shake the first three ingredients with ice and strain into your chilled glass. Top with the Champagne. Pare the rind of a lemon and twist to extract the oils into the glass then run it around the rim before using to garnish.